WHAT'S INSIDE 3 Library Presentation 6 Editorial 7 Letters to the Editor 8 After Thoughts 11 Paul Winer Concert 14 Walk in the Past 15 Inside the Pow Wow 1 Museum updates 17 Restaurants 18 The Salvation Army 20 Around Town 21 Bingo 22 Scholarships 29 Music in the Desert 31 Herb Mama 32 Puzzles 41 Nancy's Kitchen 41 Show Schedule 42 Churches 44 Classifeds 44 Paul Winer's Cartoon 47 January Photos www.DesertMessenger.com • "Quartzsite's FREE Community Paper" • 928-916-4235 WEDNESDAY, February 6, 2019 VOL. 15 # 293 Now in our 1 5 t h YEAR! Alwa y s FREE! February 6 Lots of events this weekend ����� | S������ RAIN G�����-B��� Gold show planned Feb. 8-10 The 2019 Quartzsite Gold, Treasure and Craft Show promises to be the biggest one yet. The show is com- ing up Feb. 8-10, 9am to 4 PM with daily random prizes. Corporate sponsor is Mine Lab Metal Detec- tors and Whites Metal Detectors will be available to answer all your questions. Inside vendor spaces are nearly full and outside spaces are fi lling fast. There will be lots of new ven- dors this year. Dr. Erik Melquiorre will be autograph- ing Quartzsite Gold Atlas Volume No. 3, which cov- ers east of Highway 95 From Bouse to the military land. New and interesting speakers. A really fun thing will be the 3rd annual Desert Duck Race. Come see what this is all about. It is a fundraiser for the local 4-H kids. Sierra Blaster will be making rocks into little rocks. Metal Detecting for kids also in the parking lot. More outside educational events weather permitting. www.QuartzsiteGoldShow.com The Quartzsite Desert Flyers will host this season's Fun Fly and Air Show, which will be expanded to cover three days, February 8, 9, and 10, 2019. Friday will have a demonstration of night fl ying, Saturday will be our regular air show, but expand- ed to take in the afternoon, and the fi nal day will have an informal fun fl y and a swap meet. In an attempt to attract jet planes to the fi eld, last summer the Town of Quartzsite extended the run- way by 125 feet. They also resurfaced the full 625 foot runway length. We have a "cross runway" to take advantage of the northwest winds we fre- quently experience in Quartzsite. The fi eld con- sists of six fl ight stations, 18 outside work benches, and a solid covered shelter to work in out of the wind. The area is covered with carpet to keep the dust down. Our monthly business meeting is held the sec- ond Wednesday of every month at Jimmy's han- gar, 1365 Datig Drive at 9 a.m. Membership fees are $10 annually and a membership in the A.M.A. (Academy of Model Aeronautics) is mandatory. If you have any interest in fl ying, wish to learn how to fl y, or just want to be a spectator and talk to the pilots feel free to join us. Please don't be shy. For more information, phone 916-616-7725. 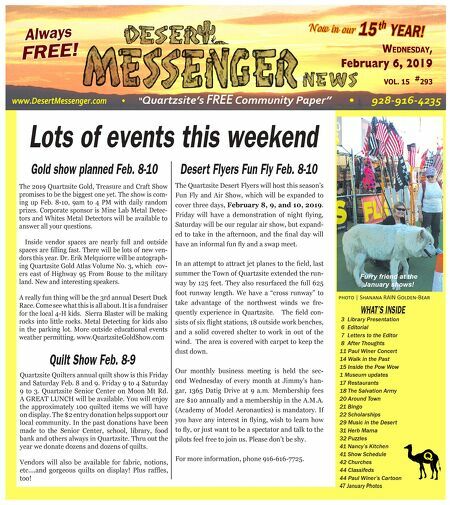 Desert Flyers Fun Fly Feb. 8-10 Quartzsite Quilters annual quilt show is this Friday and Saturday Feb. 8 and 9. Friday 9 to 4 Saturday 9 to 3. Quartzsite Senior Center on Moon Mt Rd. A GREAT LUNCH will be available. You will enjoy the approximately 100 quilted items we will have on display. The $2 entry donation helps support our local community. In the past donations have been made to the Senior Center, school, library, food bank and others always in Quartzsite. Thru out the year we donate dozens and dozens of quilts. Vendors will also be available for fabric, notions, etc....and gorgeous quilts on display! Plus raffl es, too! Quilt Show Feb. 8-9 Furry friend at the January shows!